Money’s getting tight. You are having to decide between food or electricity. You figure ramen noodles are cheap and you need electricity for your laptop so you can get gigs and get paid and pay your bills. You’ve sent out what feels like a million marketing emails with only a sprinkling of responses back. You’ve spent on equipment, on workshops, on business cards, on headshots, on comp cards, on ads…your account is shrinking with no end in sight. You are starting to doubt your work, your life, your existence and all you want right now is some RELIEF! I get it. I really do. The truth is, this part SUUUUUUUUCKS. This is also the part where you are developing the key factor that will determine your ultimate success. Grit. The thing about grit is that you can’t just develop it in a comfortable, temperature controlled room, wrapped in a fluffy blanket. Things have to be hard so you have the opportunity to choose to persevere through it. What good would a superhero story be without a huge battle that needed to be won? Have you ever seen a butterfly emerge from a cocoon? That little thing has to WORK! Or a chick peck it’s way out of an egg? It’s not like it was say “Ugh, this is too freaking hard and all I have is this weird tooth beak thing to bust out with? Forget this noise…” That bird is like “GET ME OUT OF HERE!” pecking at the shell bit by bit. Lately I’ve been think of the story from the Old Testament of the Bible of Jacob wrestling with the Angel. To sum it up, Jacob did some jerk moves including stealing his brother Esau’s blessing from their father. When Jacob was returning home and about to face his brother again, he comes face to face with a messenger of God (it may have been actual God but, either way, it was someone pretty high up the ladder.) The two start wrestling, and the Messenger tries to tap out because it is almost morning but Jacob refuses to quit until he receives God’s blessing. Which he does receive in the end. There will come a point in your creative business where you start to doubt yourself. Your choices are getting slim and you are getting frustrated. Those are the moments to hunker down and KNOW only those with true grit will succeed. You were given the spirit of a creator…and it was not given to you in vain. Push, pull, jump, claw, do what you need to do to move yourself forward. 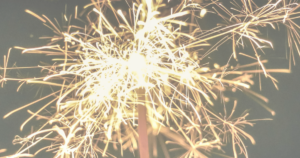 We only have a few more days until we say Goodbye, 2017 and Hello, 2018! Which means, only a few more days to do what it takes to put things in place to make January an amazing month. The chances of new clients seeing my intro emails are pretty low, since many company employees that might be interested in my voice-over services are still out on vacation. But, as an entrepreneur, I don’t want to take too many days off! The journey of becoming a business owner is always challenging, but knowing that the work I put in today will bring my little family wonderful things tomorrow pushes me to do what it takes! Tra la Tra la! It’s Christmas Traditions week! Christmas Traditions week is a newish holiday (i.e I made it up) that is only applicable to “special” families. This is my last week with the kiddos before I see them Christmas Day, so any pre-Christmas Day traditions need to be done in hyper speed. WOO HOO!! A visit with Santa! Touring neighborhoods with lights! Baking cookies! Decking the halls! Going to movies! Singing carols loudly! It isn’t so bad. We get holiday overloaded, I’m mildly overwhelmed for a week, and then done. I can go off and do adult things or nothing at all. I promised myself I would actually go out and be social this year. And also a lot of focus on planning for next year. But first…WE DO ALL THE THINGS!!! http://ieshanyree.com/wp-content/uploads/2016/07/spacer.gif 0 0 iesha nyree http://ieshanyree.com/wp-content/uploads/2016/07/spacer.gif iesha nyree2017-12-13 23:32:312017-12-13 23:32:31Christmas Overload! Ok, more like, ’tis the season to be anxious. Besides my regular amounts of entrepreneur hustle, I realized I need to hurry up and get to bustling, too, and put Christmas up in our house. I used to be the “Hostess with the Mostess” from Halloween throughout the New Year back in the day, but it’s be very different these past few years. For starters, it really has been just me to make the magic happen. No extra hands helping with cookies or picking up gifts or assembling toys. Add to that, everything needs to fit within my new entrepreneur budget…which feels pretty daunting. But my biggest challenge is one I am still holding on to. You see, my two little ones still believe in Santa. Like, BELIEVE believe. They are ten and almost ten so this might be our last year for Santa, I fear. Not that I am hinting or encouraging anything different. As long as they believe, then he’ll be here. I’m trying to figure out what to get them from their list. So far, they each only have two things…and one is a ping pong table. Ummmm, yeah, Santa’s gonna need more choices. How about you? How are you holding up with your business and the holidays? 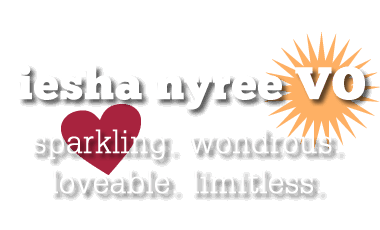 http://ieshanyree.com/wp-content/uploads/2016/07/spacer.gif 0 0 iesha nyree http://ieshanyree.com/wp-content/uploads/2016/07/spacer.gif iesha nyree2017-12-06 22:39:542017-12-06 22:39:54Here come holidays! It’s Black Friday! And the day after my birthday! To kick off the gift giving season, I really want to spend some time teaching others about Voice-Over! This Saturday (which is also Small Business Saturday) November 25, I will be doing two voice-over workshops in Charlotte. http://ieshanyree.com/wp-content/uploads/2016/07/spacer.gif 0 0 iesha nyree http://ieshanyree.com/wp-content/uploads/2016/07/spacer.gif iesha nyree2017-11-24 15:24:362017-11-24 16:24:12VO Workshop This Saturday!